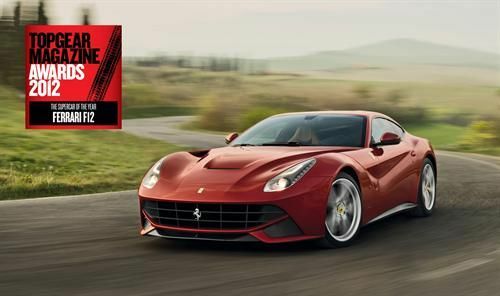 The BBC Top Gear Magzine has given the Ferrari F12berlinetta its coveted Supercar of the Year 2012 award. This is the third time Ferrari has been crowned as such by the magazine and the 11th time they've received awards from Top Gear Magazine, one of the most influential automotive publications in Europe. Charlie Turner, Editor in Chief of BBC Top Gear Magazine said "Ferrari F12. At the risk of sounding like I've quaffed freely at the charming Dario's Kool-Aid, the F12 is just extraordinary. What sort of car is the Ferrari F12? Regal but not intimidating. Blitz-fast but not scary. Ridiculously brainy but never distant. Far better than me, without patronising me. Breathtakingly beautiful, did I mention that?" The F12berlinetta is the most powerful Ferrari of all time and has received multiple awards from many sources in Europe and the Americas. It's smooth good looks, and 6.3-liter V12 engine have powered it into an Auto Bild "Design Award", The Sunday Times Driving's "Best Supercar and Luxury Car" award and the Golden Steering Wheel award from Auto Bild and Bild Am Sonntag - the first time a Ferrari has ever taken this leading German industry prize. Back to BBC Top Gear Magazine, Ferrari has had two other Supercar of the Year wins, one in 2005 for the F430 and one in 2009 for the 458 Italia. In the past ten years, Ferrari has taken 11 awards in total. The Ferrari F12berlinetta (or Berlinetta) was first introduced at the Geneva Motor Show early this year to replace the Ferrari 599 series of grand tourers. It sports a massive 730 horsepower, 509 lb-ft of torque, and jumps from 0 to 62 miles per hour in only 3.1 seconds (0-120 mph in 8.5). It's top speed is over 210 mph as it cycles through the 7 speeds in its dual-clutch semi-automatic gearbox. With all that power, the driver is happy that the aerodynamics were designed to create an "aero bridge" along the sides and flanks to hold the rear wheels down. Another deserving win for this formidable grand tourer.